Two-phase orthodontic treatment is a specialized process that encompasses two-phase-treatmenttooth straightening and physical, facial changes. The major advantage of two-phase treatment is that it maximizes the opportunity to achieve an ideal healthy, functional, aesthetic result that will remain stable over a lifetime. Typically, two-phase treatment is used for a child whose jaw will not properly accommodate all adult teeth or whose upper and lower jaw are not properly aligned. Two-phase treatment consists of an early phase to develop jaw size, a resting phase, and a second phase to ensure proper location of each tooth. The goal of the first phase of treatment is to develop the jaw size in order to accommodate all permanent teeth and to relate the upper and lower jaws to each other. An upper and lower jaw growing too much or not enough can be recognized at an early age. 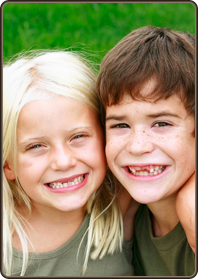 If children are found to have this jaw discrepancy after age six, they are candidates for early orthodontic treatment. Because they are growing rapidly, children can benefit enormously from an early phase of orthodontic treatment utilizing appliances that direct the growth relationship of the upper and lower jaws. This provides adequate room for eruption of all permanent teeth and may prevent later removal of permanent teeth to correct overcrowding and/or surgical procedures to align the upper and lower jaws. A successful first phase will have created room for teeth to find an eruption path. Otherwise, they may become impacted or severely displaced. Leaving this condition untreated until all permanent teeth erupt could result in a jaw discrepancy too severe to achieve an ideal result with braces. In this phase, the remaining permanent teeth are allowed to erupt. At the end of the first phase of treatment, teeth are not in their final positions. This will be determined and accomplished during the second phase of treatment. Selective removal of certain primary (baby) teeth may be needed to enhance eruption during this phase. Therefore, periodic recall appointments for observation are necessary during this period, usually on a six-month basis. The goal of the second phase is to make sure each tooth has an exact location in the mouth where it is in harmony with the lips, cheeks, tongue, and other teeth. When this equilibrium is established, the teeth will function together properly. The second phase is initiated when all permanent teeth have erupted, and usually requires braces on all the teeth for an average of 24 months. Orthodontic records – models of the teeth, x-rays, and photographs – will be necessary to determine the type of appliances to be used, the duration of treatment time, and the frequency of visits. Retainers are worn after this phase to ensure retention of a perfect smile. What if treatment is postponed? For someone with a jaw discrepancy, the disadvantage of waiting for complete eruption of permanent teeth and having only one phase of treatment is that the result may not be stable. This means that teeth may continue to move and malocclusion requiring correction may occur later in life.